Tuesday 27th May 2014 – A busy day of culture. The kids are on half term, so what better thing to do then to go out for the day. Yes I know it was persistently raining all day, but rather than stay inside all day I took them to 2, yes 2 National Trust places. They were both very close to each other, so it seemed silly not to visit both. Driving on the M25 wasn’t much fun, so I got off as soon as I could and took an alternative route, or a more scenic route as Emily put it. 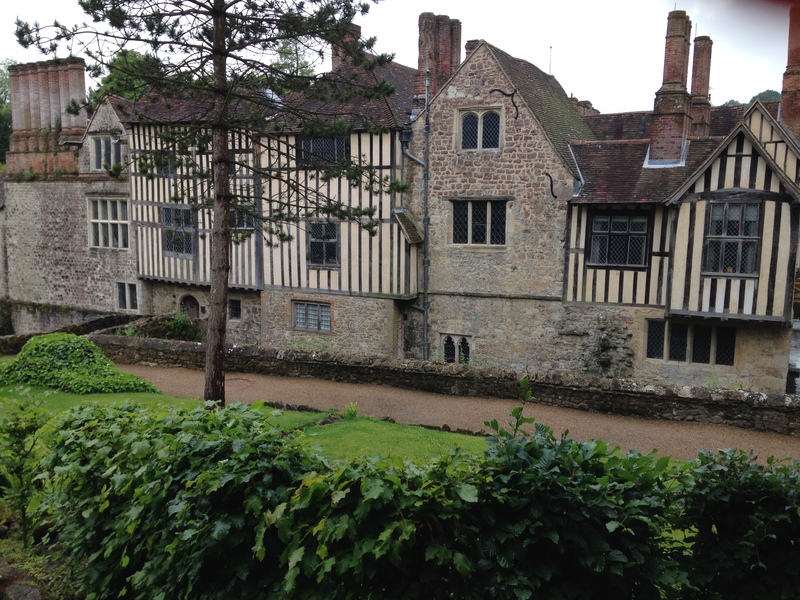 Now the first place we visited was Ightham Mote. A beautiful little place in Kent. Before we went a wandering we put on our wellingtons, just incase it was a bit muddy. Lucky we did as some places were not suitable for other delicate footwear. First though, we went in the house and had a look around. It was best that way as our wellies were clean (or cleanish anyway). George had a quiz to do, which was great fun. I had to duck going through lots of the doors as they were rather low. But we played the game of “Which bedroom would we like”. Ightham Mote. Very oldie worldie. We then had our picnic lunch and then we went exploring the lovely gardens. There were ponds, and mini waterfalls. Bridges (we had to play the “None shall pass” game) and bizarre looking trees. 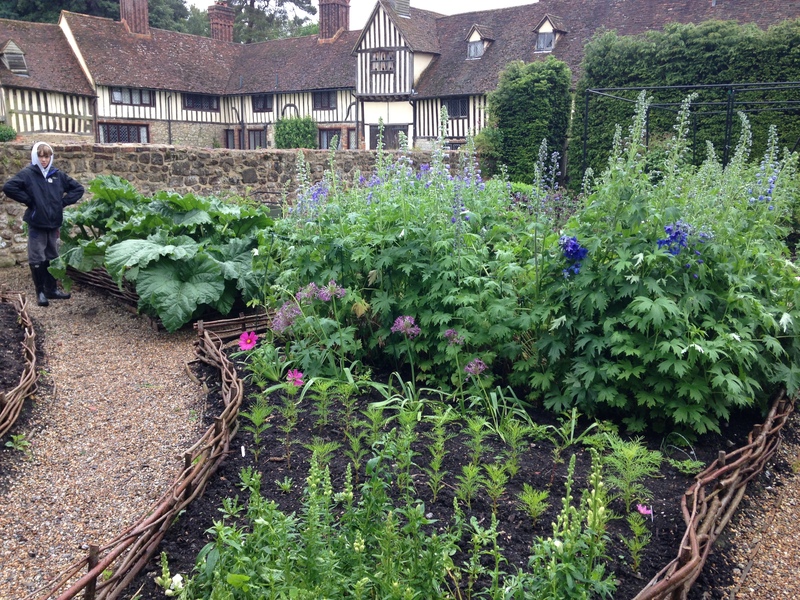 And a beautiful vegetable plot with some massive rhubarb. I was very jealous. 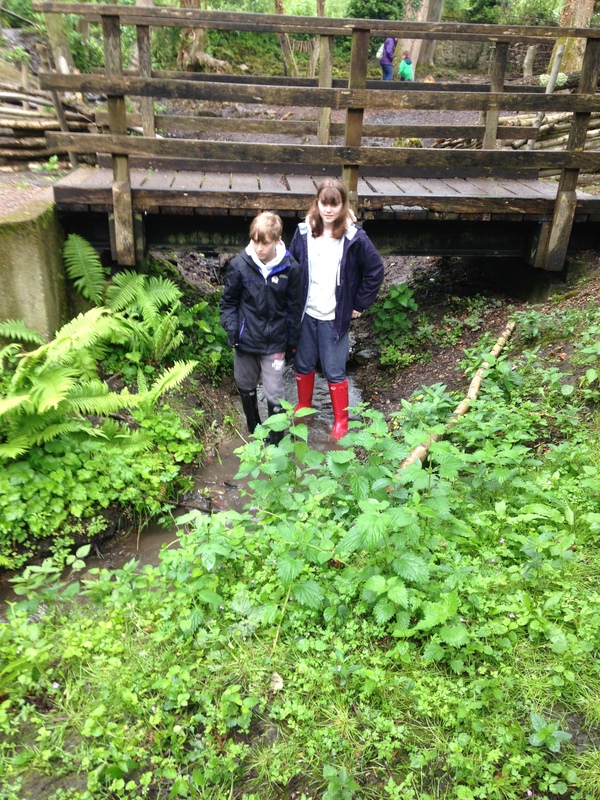 Then the kids found a little play area at the back and they both enjoyed playing in the stream that ran through it, and getting squiggly in the mud. The kids as happy as pigs in …. 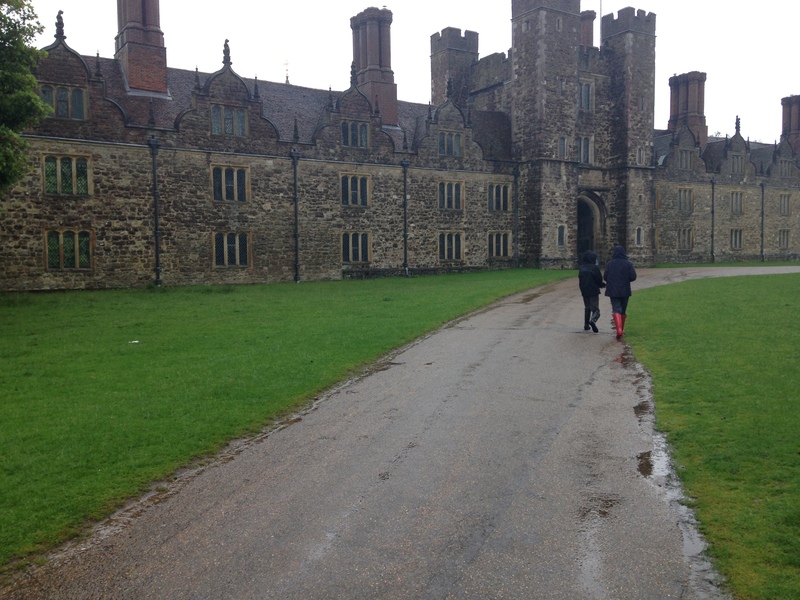 Then we left and went to visit a place called Knole. This was only 4.5 miles away, so it was a real shame not visit it. By this time the rain was really coming down, so we spent all of our time inside the house. We didn’t mind, because there was loads to look at and loads of rooms to explore. We again played the game “Which bedroom do we want”. George wanted the King’s bedroom, 1 because it was the biggest, and 2 because it had loads of gold in it! It was the only room that was behind glass, as there was a huge amount of gold in there. Emily and I looked at all the painting, and tried to find a man we’d like, but they either looked too young (I must be getting old), too old (I’m still young), too smarmy or too wimpy! We didn’t fancy any of them. But we found some dresses that we’d like. Not practical for wearing on the allotment though. It was then time to leave and attack the M25 again. It’s not a motorway I enjoy driving on, I hate it even more in the rain. If you’ve ever had the joy of driving on it, it’s nicknamed “The London Orbital Car Park”! But we got home safe and sound, and all a little exhausted. 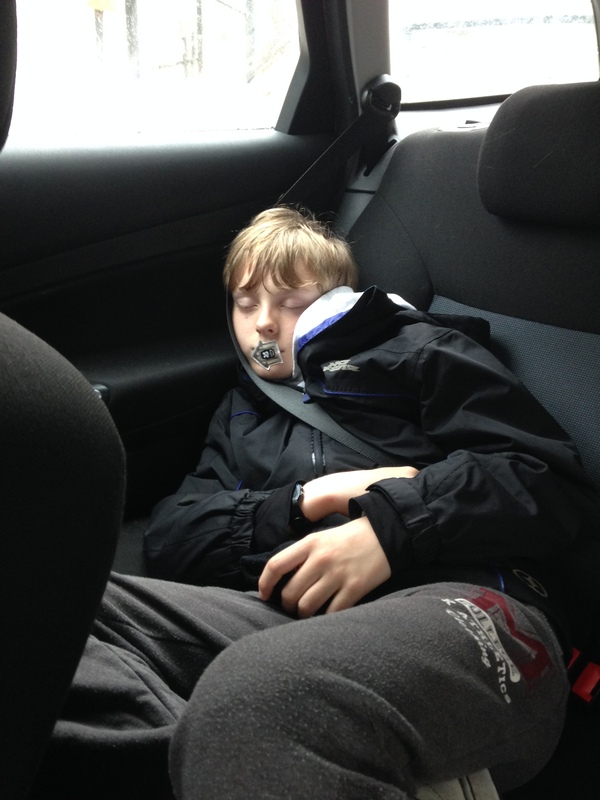 Especially George as I slept for most of the journey back. He put the sticker on his mouth, not Emily or I. I’d like to make that very clear. This entry was posted in Uncategorized and tagged claire's allotment, Ightham Mote, kent, Knole, M25, National Trust, rhubarb, sevenoaks. Bookmark the permalink. 4 Responses to Tuesday 27th May 2014 – A busy day of culture. Sounds like my kind of day out. Pity you had rain! Yes it was a shame about the rain, but heyho!! It sounds like a wonderful day out (despite the weather.) We have visited both & enjoyed them and I agree about the m25. It’s not the most enjoyable drive, butis often the “Best”. A lovely blog as always. It’s lovely to find someone else who’s been to the same places. I’d go back again, but when it’s sunny, then we could sit on the grass and have a picnic. There are deer at Knole, which we didn’t see. Maybe on a sunny day they’d come out from under the trees.